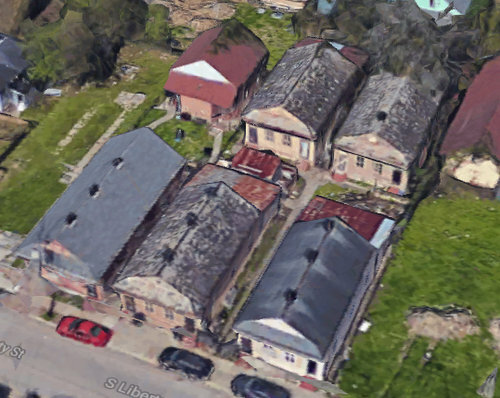 A developer’s plan to renovate a cluster of double shotguns on South Liberty Street into a series of two-family cottages is being hailed as a model of affordable historic renovation by neighbors, other builders and preservation activists as the project nears a hearing before the City Planning Commission next week. The project consists of six houses, all neighboring double shotguns on the lake side of the 3400 block of South Liberty Street. 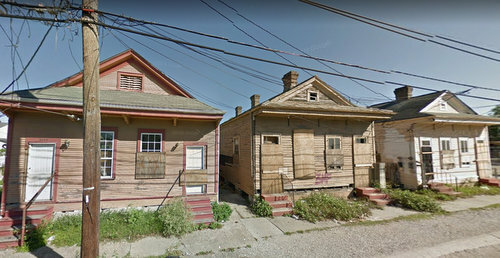 Three of the homes — 3417-19, 3421-23 and 3425-27 — sit at the front of their lot on South Liberty, while the other three (called “3417A-19A,” “3421A-23A” and “3425A-27A”) are each in their backyards. Developer Jason Riggs plans to renovate all six homes into five doubles and one single — 3425A-27A will be redesigned into one home — for a total of 11 units. Most of the units will be about 720 square feet, while the two sides of 3425-27 will be slightly smaller at 660 square feet, and the single will be 858 square feet. That original higher density of four units to a lot was previously considered a legal nonconforming use in the otherwise two-family residential district, but the properties lost that grandfathered status after becoming vacant and falling into disrepair prior to Riggs’ purchase of them. Thus, Riggs will need a conditional-use permit for multi-family homes from the City Council in order to restore them as they were. The project has garnered not only a positive recommendation from city planners, but also acclaim from other housing and preservation groups. Neighborhood Housing Services of New Orleans wrote that it has been redeveloping homes in that same area for years, and welcomes Riggs’ work as a positive addition. “Bringing these blighted houses into commerce will provide the area with much-needed rental units while also improving the neighborhood by eliminating blight and providing a safe and healthy environment for the new members of the neighborhood as well as the existing community,” according to the letter from Neighborhood Housing Services. The Louisiana Landmarks Society noted that the use of historic tax credits will require that the project is overseen by the State Historic Preservation Office, ensuring that the renovations are done appropriately. The Preservation Resource Center also named the restoration project a model for other developers, especially because they will be used for long-term housing units rather than short-term rentals. The Delachaise Neighborhood Association and several neighbors also wrote in support of the project for similar reasons. The project was previously scheduled for a hearing last month, but was delayed at the last minute because of a technical issue related to its public notice. It is now scheduled for the July 10 meeting of the City Planning Commission, which will be held at 1:30 p.m. in City Council chambers at City Hall.